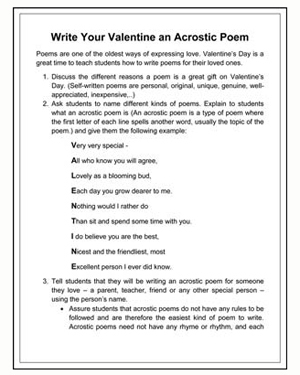 Poetry being one of the oldest ways of expressing love, Valentine’s Day is the perfect occasion to get your class to write poems. Acrostic poems are the easiest to create, and therefore this language arts activity is great for students of all ages and skill levels. Younger students can stick to words like ‘mother’ or ‘friend’, and collectively brainstorm words and phrases to use in the poem, while older students can use the name of the person they are writing for, and include poetic devices they have learnt in the class. Free, printable and fun, this Valentine’s Day activity is easily adaptable, easy to use and leaves students with a wonderful Valentine’s Day gift.